Tu Weiming, professor of Chinese history and philosophy and of Confucian studies at Harvard University speaks in a radio interview about the revival of Confucius humanism in China. The Communisit authorities are apparently encouraging a return to this traditional form of nontheism now that Communist beliefs are fading. Here is a link to the ABC News segment on Greg Epstein, which includes a few seconds of video of the Humanist Small Group, and also coverage of the autumn service project. At this week’s Humanist Small Group meeting, we discussed the South African ethical concept of ubuntu, that a person becomes a person through a relationship with other people. We had three tables full of people discussing this concept, so I can only report what was discussed at my table. I think most of us were sympathetic to the concept, but there was concern that the concept might tend to exclude people who are non-joiners by nature or have some aspect of Asperger’s Syndrome. I think we pretty much agreed that Humanism is pro-social and we encourage people to interrelate with one another, but we’re not pushing for anything to be compulsory. If a person shares Humanist values but doesn’t want to participate in a Humanist community, that is their right to do so. While some of our discussion was about the personal nature of relating to one another, there was also discussion of the political aspects of community. I expressed my own feeling after the political events of this week that secularists need to start organizing communities to provide mutual support and social service to others rather than focusing on getting the government to pass social legislation. The prospect for progressive social legislation is growing increasingly dim; rather than wait for government to solve social problems, we need to work on these problems directly–as some religious denominations already do. Please comment on this or any other aspects of todays discussion, or anything related to the concept of ubuntu. It seems to me that a strictly literal interpretation of the First Amendment would also prohibit any legislation preventing telemarketing robocalls from computers (thus awarding computers the rights of individuals). So the Court, in fact, decided that to distinguish between human beings and corporations was discriminatory and unconstitutional. Corporations are essentially granted the rights of individuals, even though unlike individuals, they’re only mandate is to seek profit and not to act as citizens of a democracy (it’s not clear to me, but I think the ruling means that foreign corporations are also free to spend unlimited funds on U.S. political races). Not being a lawyer, I can’t really speak authoritatively to the Court’s legal logic. However, it does seem to me that the instinct to read literally from texts is a reflection of a religious mode of thinking–as if God himself guided the hand of Thomas Jefferson as he wrote the text of the First Amendment. We secular people are more attuned to the idea that rules are not infallible, and good judgment is needed when to apply them. It certainly does say that “Congress shall make no law…” but in our experience, any rule taken as infallible is likely to lead us astray in some cases. Certainly Thomas Jefferson didn’t have computer robot callers in mind when he wrote the First Amendment (not even Christians claim he was a prophet–and Thomas Jefferson wasn’t even a Christian!). It shouldn’t have to be necessary to amend the Constitution to give it the flexibility to accomodate good judgment. The amendment process is so unwieldy that it is essentially impossible to change when there is not an overwhelming public consensus. My empathy and compassion as a Humanist extends to other human beings and also to sentient beings of other species. While corporations have their uses, they are legal fictions, not human beings. I think this is an issue that should unite liberals and conservatives. While certain political operatives may be salivating at the prospect of corporate spending in support of their candidates, the likely result of this ruling, if it cannot be altered through legislation, which is questionable, is that governments will be increasingly run for the benefit of corporations and use their taxing power to raise funds to pay for contracts to said corporations. This will undermine both liberal hopes for more equality and conservative hopes for a less costly government. Robotic literalism is bad all around. 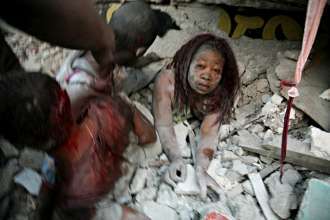 As you must know by now, Haiti has been rocked by a devastating earthquake with a large loss of life and a large need for humanitarian relief. As Humanists, we can’t say that “our prayers are with the people of Haiti” but we can display our compassionate intentions by donating to earthquake relief. One avenue for providing relief that I can recommend is the Haiti Earthquake Relief Fund of the Unitarian Universalist Association. The UUA is liberal denomination with a lot of Humanists, and I’m confident they will handle the money appropriately.